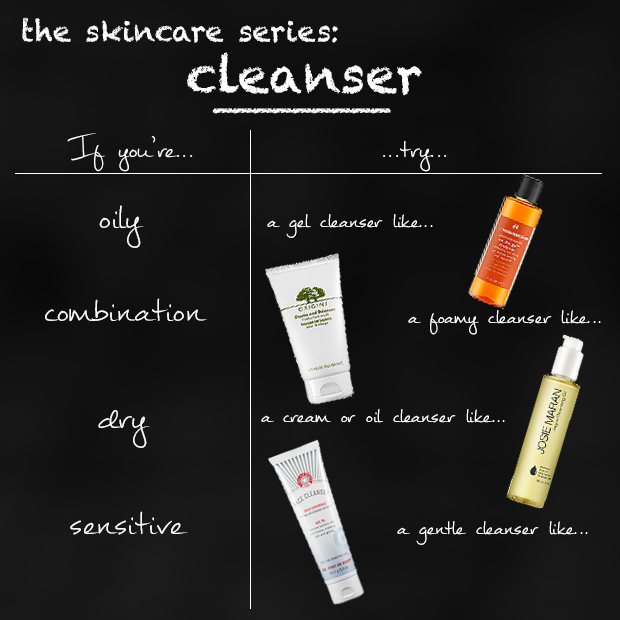 The Skincare Series: Cleanser – amandarobots. The first step to doing that is cleanser. There are cleansers on the market that address specific skin issues – like aging, dark spots – but I find it’s more effective to choose a cleanser based on skin type rather than skin issue. Since a cleanser is only on your skin for about two minutes a day, it doesn’t have enough contact time to actually address something like dark spots; that’s why its primary job should be balancing and cleaning the skin. If you have oily skin, try a gel-based cleanser. (Look for ones that are clear.) It’s going to get rid of excess oil, leaving your skin feeling refreshed but not stripped. Ole Henriksen On The Go Cleanser didn’t work for me, but it would be great for someone with very oily skin. If you have combination skin, you probably have some oily spots – particularly the T-zone – and some dry patches. If that’s the case, you want to clean the oily without stripping the dry. To do that, try a creamy, foamy cleanser with balancing properties. I really love Origins Checks and Balances*. If you have dry skin, oil and cream cleansers are your friends because they’re going to break down makeup and dirt but leave some moisture behind. (I actually really like oil and cream cleansers as part of a two-step cleanse, but that’s a tale for another post!) If you choose to go with cream, look for one that has lots of oils and butters in it. If you choose to go with oil, look for a cleansing oil that doesn’t leave too much residue behind. Josie Maran makes an Argan Cleansing Oil that I’m planning to try when I’m done my current cleansing oil (which is the Sephora brand one!). If you have sensitive skin, you’ll want a very gentle cleanser. Not all sensitive skin is the same, and what works for one person’s skin might cause a reaction for another’s. However, First Aid Beauty makes a gentle cleanser that is very mild and is a good place to start. Be sure to avoid fragrances and essential oils that might irritate the skin. Keep in mind that skincare is a bit of an experiment. Be sure to ask for samples of any product before committing to it. Also, in my opinion, if there’s anything worth splurging on, it’s your skincare. In my experience, you really do get what you pay for when it comes to cleanser, moisturizer, and serum. Of course that doesn’t mean you have to go for the $300 creams; however, a $25 cleanser might ultimately serve you better than a $5 one because you’re paying for quality ingredients.